It is back to school time here in the Northwest. With new classes and new things to learn comes new assignments and homework. Depending upon your young budding future leader of tomorrow’s learning style homework could be exciting, stressful, or anxiety inducing. No matter the student we as parents want to give our kids all the tools we can to help them be successful. A great way to help your kids with their homework time is with a clean and stress-free atmosphere to work in. Studies have shown that is it harder to concentrate and focus in a disorderly environment. There are two reasons why it is more difficult to study in a messy space: one, it creates distraction filling the mind with other things to focus on rather than the work you hope to accomplish and two, clutter has been proven to subconsciously stress us out. Here are some tips to create and keep a tidy work space. Prioritize: If you or your child wait to clean the space until homework time it can be detrimental. It will only make the job of getting homework done seem even more daunting. It can also re-direct focus from clearing the space for homework to just cleaning. While you are in the mood to change and prepare things for the upcoming school year put together a cleaning chart that includes the area used for homework. Create an Out of Sight Out of Mind Backup Plan: Life happens and things come up to rearrange the schedule so when clutter left behind is in the way of homework stash it quickly in a bin or drawer to be put away later. Form New Habits: Get yourself and your kids in the habit of putting things away right when they finish. Have a place for everything and put everything back in its place right when it is done being utilized. Have kids put assignments right into their binder and then put their binder into their bag. Have writing utensils put back in a cup or box in a drawer. Put crayons and markers back in their spot and so on. When things are put away right after use it is less of a job than putting many things away that have accumulated and gotten out of control later. Make the Space Inspiring: Create an atmosphere that your kids will love working in, whether it’s a cute desk area in their room, a family desk in the great room, or a special spot next to a parent or caregiver while they cook dinner in the kitchen. Make sure there is a supply of fresh supplies nearby. Consider a Deep Cleaning: there is no better feeling than a space that is completely clean, organized, and refreshed as much as possible. It’s like having a brand new blank slate to launch from. A great way to make your home and any workspace feel its freshest is with professional deep cleaning. 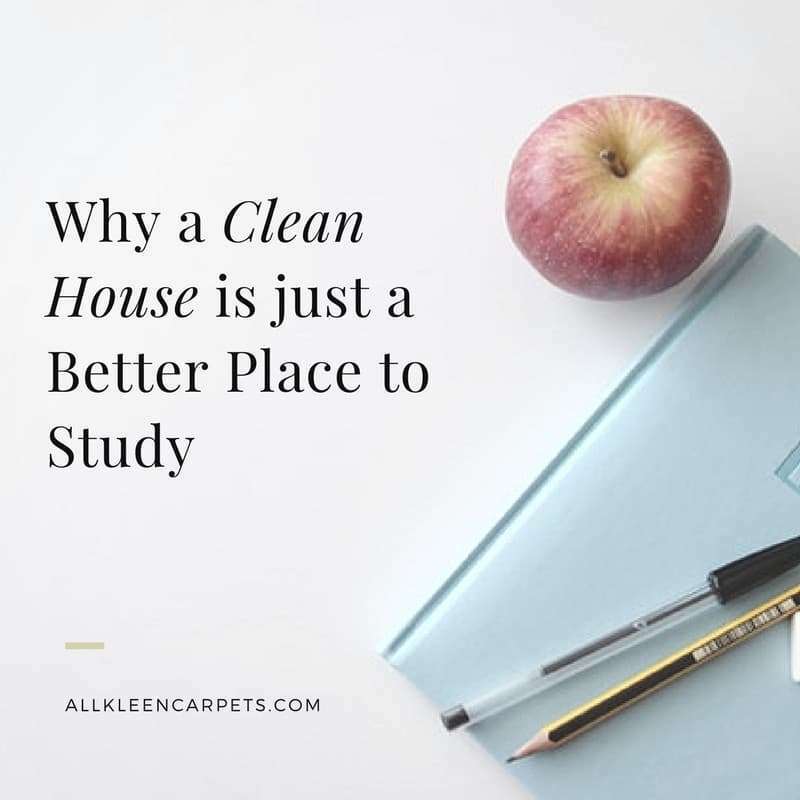 Let All Kleen help you create the best possible homework atmosphere in your home. Make an appointment online.